King of Babylon mentioned in Dan. v. and viii. as the son of Nebuchadnezzar and as the last king before the advent of the Medes and Persians. The Greek form Βαλτάζαρ is used both for the Hebrew "Belshasar," or less accurately, (ib. vii. 1), and for "Belteshazzar" ( , Dan. i. 7). The name appears also in Baruch i. 11 as "Balthasar" (R. V. "Baltasar"). There can be no doubt, however, that the allusions to this personage in Baruch and elsewhere in extracanonical literature are all based on the data given by Dan. v. and viii. It is stated in Dan. v. that Belshazzar gave a banquet to the lords and ladies of his court, at which the sacred vessels of the Jerusalem Temple, which had been brought to Babylon by Nebuchadnezzar at the time of the Judean captivity in 586 B.C., were profaned by the ribald company. In consequence of this, during the turmoil of the festivities, a hand was seen writing on the wall of the chamber a mysterious sentence which defied all attempts at interpretation until the Hebrew sage Daniel was called in. He read and translated the unknown words, which proved to be a divine menace against the dissolute Belshazzar, whose kingdom was to be divided between the Medes and Persians. In the last verse we are told that Belshazzar was slain in that same night, and that his power passed to Darius the Mede. The references in the Talmud and the Midrash to Belshazzar all emphasize his tyrannous oppression of his Jewish subjects. Several passages in the Prophets are interpreted as though referring to him and his predecessors. In the passage, "As if a man did flee from a lion, and a bear met him" (Amos v. 19), the lion represents Nebuchadnezzar, and the bear, equally ferocious if not equally courageous, is Belshazzar (Esther R., Introduction). The three Babylonian kings are often mentioned together as forming a succession of impious and tyrannous monarchs who oppressed Israel and were therefore foredoomed to disgrace and destruction. The verse in Isa. xiv. 22, "And I will rise up against them, saith the Lord of hosts, and cut off from Babylon name and remnant and son and grandchild, saith the Lord," is applied to the trio. "Name" refers to Nebuchadnezzar, "remnant" to Evil-merodach, "son" is Belshazzar, and "grandchild" Vashti (ib.). The command given to Abraham to cut in pieces three heifers as a part of the covenant established between him and his God, is thus elucidated, "And he said unto him, take unto me three heifers" (Gen. xv. 9 [A. V. "a heifer of three years old"]). This symbolizes Babylonia, which gave rise to three kings, Nebuchadnezzar, Evil-merodach, and Belshazzar, whose doom is prefigured by this act of "cutting to pieces" (Gen. R. xliv.). Belshazzar's feast, in the course of which the sacred vessels of the Temple in Jerusalem were put to sacrilegious use (Dan. v.), is traced by the Rabbis to his miscalculation in chronology. He well knew that the period of Jewish exile in Babylonia, according to Jeremiah's prophecy, was not to exceed seventy years (Jer. xxix. 10). Belshazzar's starting-point was the accession of Nebuchadnezzar, who reigned forty-five years. To this he added the reign of Evil-merodach, which, according to tradition, continued for twenty-three years, and his own reign of two years, making in all seventy. "Jeremiah must be wrong," argued Belshazzar, "for the limit has been reached, and since the Jews have not yet returned to their land, they probably will not return any more." Emboldened by this erroneous calculation, he made impious use of the sacred vessels at the royal feast, where the sound of revelry mingled with hymns to the heathen gods. The miraculous handwriting on the wall, the fall of Babylon, and the king's violent death on that fatal night soon followed. Ahasuerus also erred in his calculation as to the period of the Babylonian exile, though his starting-point is shifted to a later date than that of Belshazzar. The Rabbis assert that the true basis for this reckoning is the destruction of Jerusalem. For the famous prophecy of Jeremiah is properly understood by Daniel when he says (Dan. ix. 2), "In the first year of his [Darius'] reign, I Daniel understood by books the number of the years, whereof the word of the Lord came to Jeremiah the prophet, that he would accomplish seventy years in the desolations of Jerusalem" (Meg. 11b et seq.). The Midrash enters into the details of Belshazzar's death. It is stated that Cyrus and Darius were employed as doorkeepers of the royal palace. Belshazzar, being greatly alarmed at the mysterious handwriting on the wall, and apprehending that some one in disguise might enter the palace with murderous intent, ordered his doorkeepers to behead every one who attempted to force an entrance that night, even though such person should claim to bethe king himself. Belshazzar, overcome by sickness, left the palace unobserved during the night through a rear exit. On his return the doorkeepers refused to admit him. In vain did he plead that he was the king. They said, "Has not the king ordered us to put to death any one who attempts to enter the palace, though he claim to be the king himself?" Suiting the action to the word, Cyrus and Darius grasped a heavy ornament forming part of a candelabrum, and with it shattered the skull of their royal master (Cant. R. iii. 4). See Daniel, and Nebuchadnezzar in Rabbinical Literature. The name "Belshazzar" was previously held to have been invented by the author of the Book of Daniel, which has long been recognized as a Maccabean production (see Daniel). 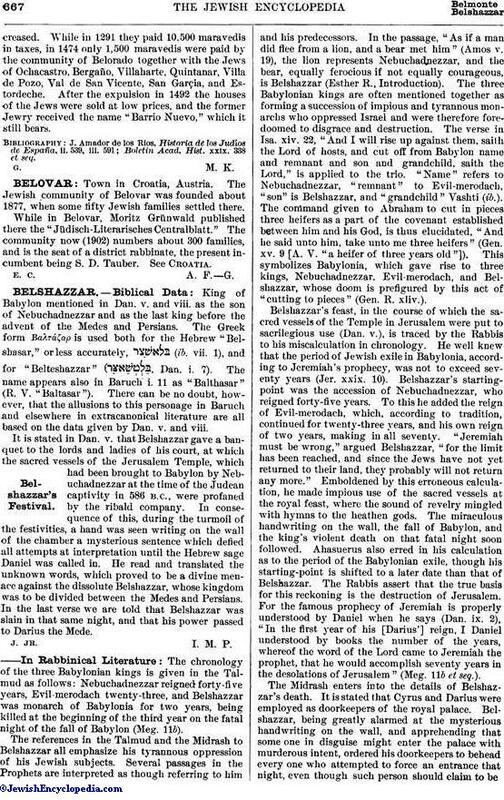 Since the discovery and decipherment of the cuneiform inscriptions, however, "Belshazzar" is now generally admitted to be the Hebrew-Aramaic equivalent of the Babylonian form "Belsharuṣur" (Bel preserve the king), which has been found in the cuneiform documents as the name of the eldest son of Nabonidus (Nabuna'id), the last native king of Babylon (555-538 B.C.). The most important allusions to Belsharuṣur in Babylonian literature are clearly those in the two inscriptions of Ur (Nabonidus) (see Prince, "Daniel," p. 36), and in the so-called "Annals of Nabonidus" (see Mene), which is the chief document relating to the fall of Babylon at the hands of the Persians. In the Ur records Nabonidus prays that his son may live long and piously, although it is not stated why special mention should be made of the prince here. It may be conjectured, with Tiele ("Gesch. Assyriens," p. 463), that Belshazzar was governor of Ur; or it is possible that the king, who was noted for his strictness in religious matters, may have attached some special importance to the cult of the moon-god practised in Ur. The petition that the king's son may not incline to sin may also imply that Belshazzar had in some way offended the religious classes, who, as is well known, supervised the preparation of the inscriptions. The allusion to the prince in the "Annals of Nabonidus" shows plainly that he remained with the army in northern Babylonia, most probably in the capacity of commander-in-chief, while his father was living in Tema apparently free from the cares of government and applying himself to his favorite study of religious archeology. In the "Annals" the name "Belsharuṣur" does not occur, the reference being merely to the son of the king; but there can be no doubt that the first-born is meant. The references in the contract literature to Belshazzar throw no further historical light on his career (see Prince, ib. pp. 263, 264). That the name was not an unusual one is seen from the fact that certainly two other persons are called by it in the Babylonian inscriptions (Prince, ib., pp. 11, 29, 35). The following important differences between Belsharusur and the Belshazzar of Daniel are patent. The former was the son of the last king of Babylon, but never reigned, except possibly as coregent with his father; while the latter is distinctly called the last king and the son of Nebuchadnezzar, both of which statements are undoubtedly made in perfectly good faith by the author of Daniel. It can not be shown that the Belshazzar of Daniel was intended, as some scholars have supposed, for Evil-merodach, son of Nebuchadnezzar, and was used by the Biblical author as a secondary name. Had the author meant this, he would never have made Daniel declare to the Babylonian monarch that his kingdom was about to pass to the Medes and Persians. The prophecy was evidently intended for the last king, as there would have been no point in such a warning delivered a generation before its fulfilment. Besides this, had the author regarded his Belshazzar as Evil-merodach, he would have deliberately passed over in silence the reigns of several Babylonian kings between the death of Evil-merodach and the foreign supremacy. This will appear plainly from an examination of the list of the last kings of Babylon: Nebuchadnezzar, 604-561; Amel-Marduk (Evil-merodach), 561-559; Nergalsharuṣur (Neriglissar), 559-555; Labashi-Marduk, 555, reigned only nine months; Nabonidus, 555-538; Cyrus captures Babylon, 538. There can be no doubt then that the author of Daniel regarded Belshazzar as the last native king of Babylon. 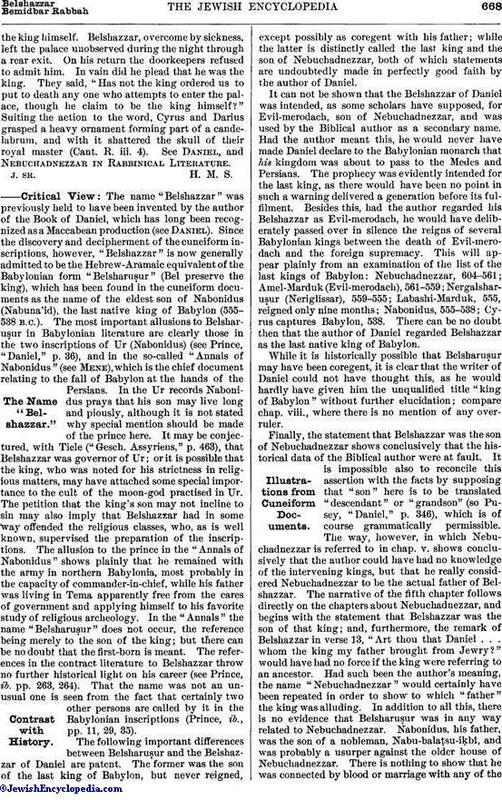 While it is historically possible that Belsharuṣur may have been coregent, it is clear that the writer of Daniel could not have thought this, as he would hardly have given him the unqualified title "king of Babylon" without further elucidation; compare chap. viii., where there is no mention of any overruler. Finally, the statement that Belshazzar was the son of Nebuchadnezzar shows conclusively that the historical data of the Biblical author were at fault. It is impossible also to reconcile this assertion with the facts by supposing that "son" here is to be translated "descendant" or "grandson" (so Pusey, "Daniel," p. 346), which is of course grammatically permissible. The way, however, in which Nebuchadnezzar is referred to in chap. v. shows conclusively that the author could have had no knowledge of the intervening kings, but that he really considered Nebuchadnezzar to be the actual father of Belshazzar. The narrative of the fifth chapter follows directly on the chapters about Nebuchadnezzar, and begins with the statement that Belshazzar was the son of that king; and, furthermore, the remark of Belshazzar in verse 13, "Art thou that Daniel . . . whom the king my father brought from Jewry?" would have had no force if the king were referring to an ancestor. Had such been the author's meaning, the name "Nebuchadnezzar" would certainly have been repeated in order to show to which "father" the king was alluding. In addition to all this, there is no evidence that Belsharuṣur was in any way related to Nebuchadnezzar. Nabonidus, his father, was the son of a nobleman, Nabu-balaṭsu-iḳbî, and was probably a usurper against the older house of Nebuchadnezzar. There is nothing to show that he was connected by blood or marriage with any of thepreceding kings. It is interesting to observe in this connection that in the Chaldean legend given by Abȳdēnus, of doubtful date, the last king of Babylon is spoken of as a son of Nebuchadnezzar (compare Schrader, in "Jahrbücher für Protest. Theologie," 1881, pp. 618-629). It should be remarked that the force of the narrative of the fifth chapter of Daniel would have been materially weakened had the author known and made use of the names of the kings intervening between Nebuchadnezzar and the last king. The whole point of the fifth chapter is a comparison between the great Nebuchadnezzar, the real founder of the Babylonian monarchy, and the insignificant last king who suffered the reins of government to slip from his feeble hands, with a prophetic emphasis on the coming stranger people who should divide among them the empire of Nebuchadnezzar. There can be no doubt that the son of Nabonidus was the prototype of the Biblical Belshazzar. The author of Daniel simply did not have correct data at hand. 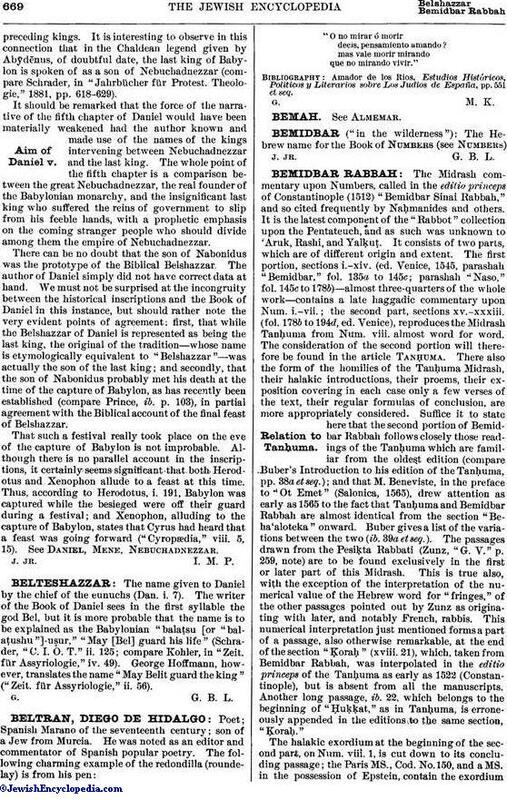 We must not be surprised at the incongruity between the historical inscriptions and the Book of Daniel in this instance, but should rather note the very evident points of agreement: first, that while the Belshazzar of Daniel is represented as being the last king, the original of the tradition—whose name is etymologically equivalent to "Belshazzar"—was actually the son of the last king; and secondly, that the son of Nabonidus probably met his death at the time of the capture of Babylon, as has recently been established (compare Prince, ib. p. 103), in partial agreement with the Biblical account of the final feast of Belshazzar. That such a festival really took place on the eve of the capture of Babylon is not improbable. Although there is no parallel account in the inscriptions, it certainly seems significant that both Herodotus and Xenophon allude to a feast at this time. Thus, according to Herodotus, i. 191, Babylon was captured while the besieged were off their guard during a festival; and Xenophon, alluding to the capture of Babylon, states that Cyrus had heard that a feast was going forward ("Cyropædia," viii. 5, 15). See Daniel, Mene, Nebuchadnezzar.